Thanks for creating and publishing these calendars! I follow F1, MOTOGP, Formula E, NASCAR, Indy, and NHRA. You made it so much easier in keeping track of these. I’ll see what I can do with GT4! I have just added MXGP, though I might not do a separate blog post for that. OK: I have added GT4 European and GT4 America links above. I’ll be adding calendar dates to them tomorrow. The calendars are great! Just need ADAC GT and International GT Open and will have all that I need for the 2019 season. A lot better than the printouts I used last year. Thanks for putting these together! GT Open and ADAC were next on my list, they’ve been done this evening. All that remains is Rallycross and then I’m done. Rallycross has been added: World, Europe and Americas. 2019 Calendars are now complete! Hi, there seem to be a mistake int the F1 calendar: it has two R10’s. Thanks for the precious time saving calendars, though! Good pickup, I didn’t see that at all! Is this for all of them or is it only with a particular calendar? Try another championship and see if that works. 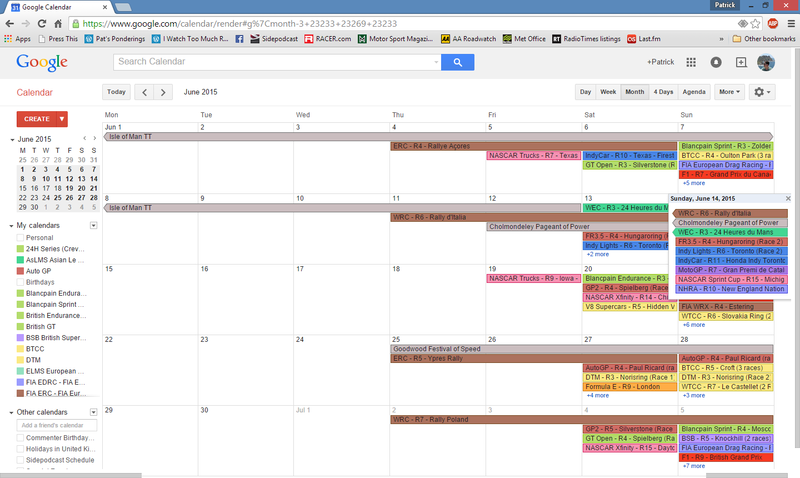 Sadly I’ve had to delete the Formula European Masters dates. This is the series that used to be Formula 3 European Championship or F3 Euro Series. It has folded due to lack of entrants. This is honestly beyond helpful! A total God send for a busy writer! 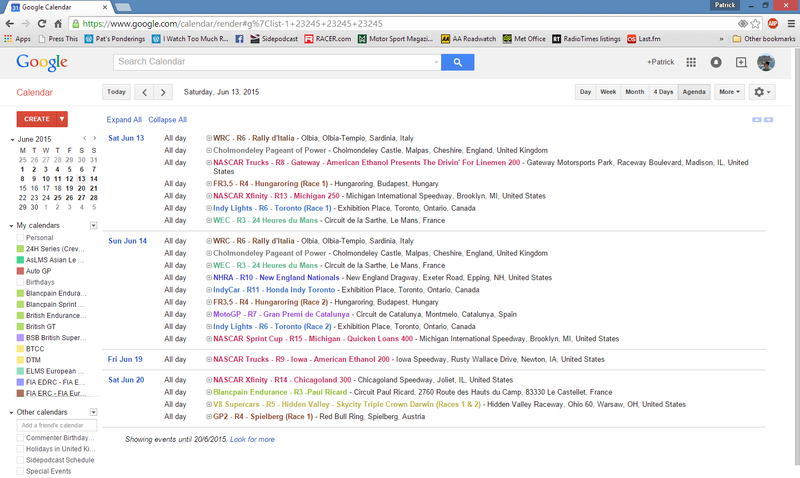 Don’t suppose you have a Google Calendar link for all four-wheeled and two-wheeled series overall? Or… do you know if it is possible to merge the calendars together?? I don’t have one because that would mean manually copying the existing ones to it. At least, I don’t know a way to merge them. I’d previously planned to do a ‘Big Sportscar Races’ one but put it off for being extra work! I’ll see what I can find and come back. Wonderful, your entries outnumber all the other items on my calendar (I know “I should get out more!” but I am retired and taking it easy). Can we have the BRDC Formula 3 championship please, the highlights are shown on UK fta TV (ITV4). Many thanks for taking the trouble with these calendars, the world needs more people like you.